We will discuss them in-depth shortly. In the 3rd row, click on the Extensions icon. In the left column click on Share Menu. 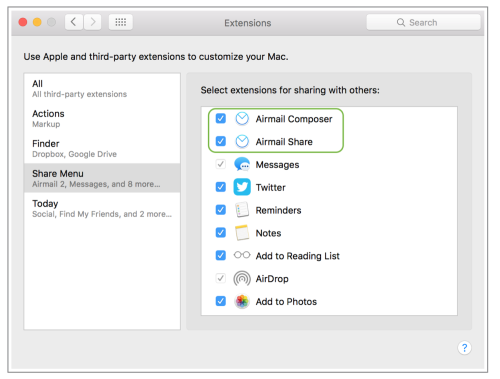 Select the Airmail Composer and Airmail Share extension in the extension list. Close Extensions and System Preferences windows. The Airmail Share extensions are now enabled. composer window without leaving the active application. As seen in the image below, the document is attached when choosing the Airmail Composer extension. Continue composing the email as normal and click on send. leaving the active application and going to Airmail app, where messages can be composed as standard. right click menu in Finder. Located the Share icon in Finder or any other app that supports it. Click on it to open the Sharing Menu. Click to chose which of the Airmail Extension to use. The file that was shared will be added to a new mail composer window as an attached file. Compose the email as normal and click send.